Wireless Mobility is now the norm and people expect to be connected via wireless wherever they go. Surelock Communications was founded more than ten years ago by experienced R.F. engineers who saw a need to address the need for ubiquitous wireless coverage inside the workplace. Today Surelock specializes in affordable In-Building wireless systems that empower their customers productivity and well being by creating a stable and secure mobile wireless environment. Surelock Communications Inc. 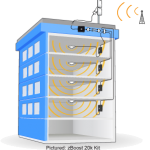 Designs and installs custom wireless solutions that improve weak cellular &Rf signals inside buildings. Weak RF signal will cause dropped calls, missed emails and text messages, and poor data connections for B2B apps and other wireless enabled systems . We specialize in improving signal in commercial buildings ranging from metal warehouses to multi story office buildings and sports arenas. We work with all of the major wireless carriers and broadband providers. In Building cellular reception and Wi-Fi signal quality are highly vulnerable to signal attenuation caused by the RF signal passing through solid objects including; external and interior walls, floors and windows. External shrubs and trees also have a negative effect on signal strength and RF propagation. Trees in the direct path of the signal can account for 10-20 dB loss. Walls account for 10 – 15 dB depending on the construction material. Metal walls and stucco account for the highest loss this includes walls constructed of dry wall over steel studs. Metallic tinted and mirrored glass windows have a very high loss as they will actually absorb and conduct RF signals. Floors of building can account for 10 – 25 dB of loss with concrete and steel being on the high end. Both modern cast in place reinforced concrete and prefabricated steel buildings are particularly vulnerable to weak or no RF signal.